With digital cameras now so popular and the numbers of photo storage cards that everyone needs to use them getting to astronomical levels, probability must dictate that instances of users deleting images or corrupting the cards must also be on the rise. So, if you're in that boat or want to arm yourself should the inevitable happen, there are a few free card file recovery utilities available. I've already mentioned PC Inspector Smart Recovery, Exif Untrasher, Zero Assumption Digital Image Recovery and PhotoRec but I've found another one for Windows that looks worth adding to the armoury. 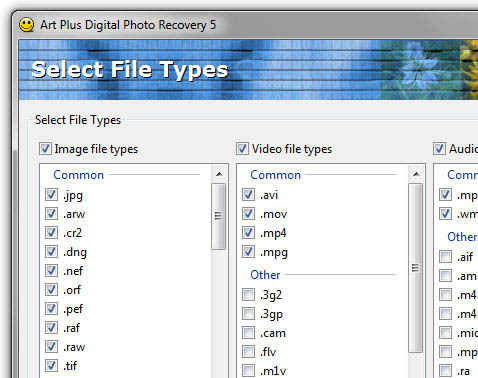 The free Art Plus Digital Photo Recovery tool can help you recover lost images from corrupted or accidentally formatted digital camera memory cards. It works with all types of memory cards. It can recover images from formatted cards. It reads corrupted cards (even if they're not recognized by Windows). It recovers JPG, TIF and most RAW files (DNG, Canon CR2, Konica-Minolta MRW, Nikon NEF, Olympus ORF, Pentax PEF, Sony ARW, SRF and SR2). Runs on Windows 95, 98, ME, NT, 2000, XP and Vista. The publishers state that the program should be able to read all memory cards currently available on the market and recover lost JPG, TIF and most of popular RAW file formats and, while it's not optimized for that task, it also reads damaged floppys, CDs and DVDs. All you have to do now is hope you never need to use any of them. Pity but it looks like this product is no longer free. Twitter - Is It Useful? Picasa For Macintosh In 2008!